February 2008 - The Game Developer's Conference may have packed its bags and fled San Francisco until next year, but it's left enough buzz-worthy news in its wake to keep gamers gabbing for the next twelve months. From announcements and surprises to games and goodies, the industry's first big event of the year will be on the minds and tongues of many this week, ensuring the coming days will be the least productive in workplaces since the release of Halo 3; honestly, who can get any work done when there are trailers to download, blogs to read, and of course, brand new game images to weed through and select as our new desktop backgrounds? Cheat Code Central returns to the office this week with all the cool info, a bag of swag, and tired feet (damn, that convention center is big!) to deliver the big, bad, and bizarre of GDC 08. Grab some caffeine, hunker down in your cubicle, and enjoy CCC's easy-to-digest GDC wrap-up. Ninja Gaiden: Dragon Sword knocked our tabi boots off with its incredibly fluid touch play and we-can't-believe-this-is-a-DS-title visuals. Not since Link's turn in Phantom Hourglass have we been so psyched to swing a sword via stylus. Holding the DS like a book, ala Brain Age, is also a nice addition to this genre. 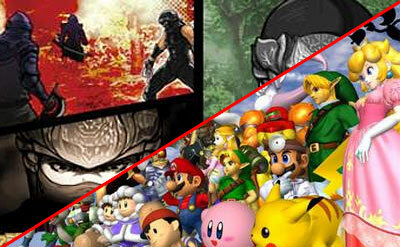 Sure, we could've played Super Smash Bros. Brawl. That is, if we still wanted to be standing in a line right now. Despite the fanboy-flooded crowds, we did get to spy this one from a distance. Based on the fast-paced, easy-on-the-eyes on-screen action, not to mention the smiles stretching across the faces of the lucky participants, we're sure this one will surpass the hype. Lego Batman may not have been playable, but watching one of Traveler's Tales producers run around in the Lego-constructed Gotham City, causing endless block-busting as the Dark Knight and the Boy Wonder, was probably our most memorable twenty minutes at GDC. And that was before they told us about "Villain Mode." Holy addictive gaming, Batman! Don't get us wrong; EA's super ambitious attempt at evolving the FPS looks amazing. 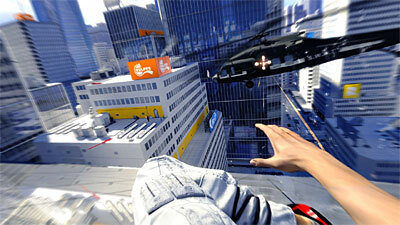 But without any gunplay, Mirror's Edge looked like a lot of first-person running and jumping; very cool, but can Matrix-like acrobatics sustain an entire game? With Gears of War 2, Ninja Gaiden 2 and Fable 2 making appearances, Microsoft's keynote was a sensational sequel-spewing event that set the bar pretty high for their E3 08 press conference--it'll take more than Halo Wars and Alan Wake to top this.